8/3 50' 220 Volt 50 Amp Heavy Duty Lighted 8/3 Welder Extension Cable. 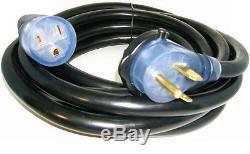 This extension cord comes with molded on plugs and will handle 50 amps. It will fit most welders including. Miller Millermatic welders, Lincoln Power MIG series welders, Hobart Handler, Ironman and Betamig welders, Century welders and many more. This cord has a NEMA 6-50P plug configuration. THIS IS NOT A DRYER STYLE PLUG. Highly flexible annealed 30 gauge bare copper conductors, insulated with an STW water-resistant jacket. Operating temperatures range from -40°C to +90°C (-40°F to 194°F). The 8 gauge, 3 conductors are rated at 250V, 50A. Designed for indoor and outdoor heavy industrial use. These cords are flexible, durable, and manufactured to meet or exceed all UL and OSHA requirements. Receptacle lights up when the cord is powered. Meets all UL & OSHA requirements. 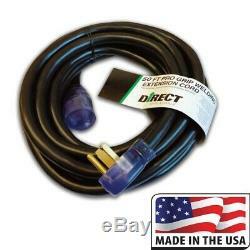 The item "Direct Wire 50' 220 Volt 50 Amp Heavy Duty 8/3 Welder Extension Cord MIG TIG" is in sale since Tuesday, January 31, 2017. This item is in the category "Business & Industrial\CNC, Metalworking & Manufacturing\Welding & Soldering Equipment\Welding\Welding Cables". The seller is "torchking" and is located in Monroe, Ohio. This item can be shipped to United States.